On Monday, August 21, 2017, all of North America will be treated to an eclipse of the sun. The Bay Area is outside the path of totality — where the moon will completely cover the sun — but there’s still plenty to enjoy! 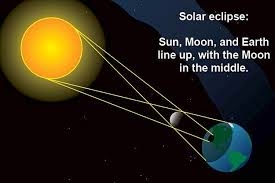 Come to the Menlo Park Library for a series of special eclipse-related events from July 13 to August 21. Are you ready for the sky event of the decade? Dr. Andrew Fraknoi is going to entertain & educate with an illustrated, nontechnical talk, as he gets us ready for the big “all-American eclipse” that’s coming up on August 21. The ancient Mayans developed some of the most accurate pre-telescope astronomy in the world! Join Peopleologie to learn about Mesoamerican contributions to our calendar system, mathematics, astronomy, and architecture. Later, we’ll get creative, pressing ancient-style carved animal hieroglyphs into clay to create a wall hanging-plaque. Create a simple solar projector to keep your eyes safe when you experience this rare eclipse! We’ll provide instructions & materials. It’s special hands-on fun, when the library’s program room will turn into a planetarium, surrounding the students in stars and light. In front of the library – all agesIt’s the big event! Join us outside the library for snacks & viewing. We’ll bring the safety glasses for you to use. Drop in for an evening revisiting the big event, as it was seen in its path of totality.